Ross & Cromarty Roots | Applecross Burial Ground. 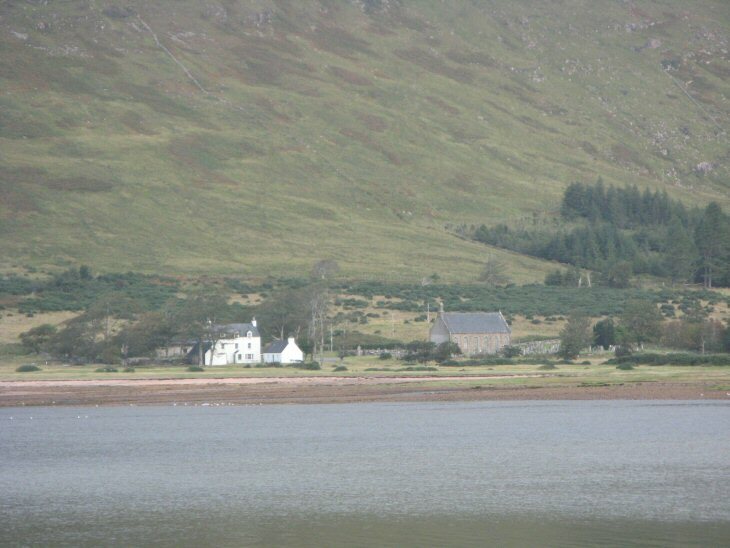 The view across Applecross Bay shows the manse and church with surrounding burial ground. The site is an ancient religious one. St. Mealrubha (7th/8th C), believed to be the most renowned Christian missionary in Scotland after Columba, is buried here (unmarked), possibly after being killed by Vikings on Black Isle. The name Applecross is derived from Aber Crosan (the nearby river is the Crosan). In Gaelic, "A'Chromraich", the name for the peninsula signifies 'girth', as in defining a 'sanctuary', and alluding to the place of safety around Maelrubha's monastery. The Applecross Heritage Centre (behind the manse) illuminates the local history of the area and its place in Scotland's story. The bounds of Applecross Parish once included land north of Loch Torridon, including Diabaig. Despite its place as a long-established important religious site, this burial ground has very few old table or flat stones, compared to the numbers at Lochcarron, Gairloch and Lochbroom. There is a local tradition that an old burial ground existed in the land closer to the river; future archaelogy survey here may be able to uncover this. Picture Added on 12 September 2009. Added by Irene Alderson on 26 July 2018.